Q. A player's ball lies several inches to the side of a sprinkler head. The sprinkler head does not physically interfere with the player's stance or the area of his intended swing. However, the sprinkler head bothers the player mentally. Is the player entitled to relief under Rule 24-2b? A. No. See Rule 24-2a. Q. 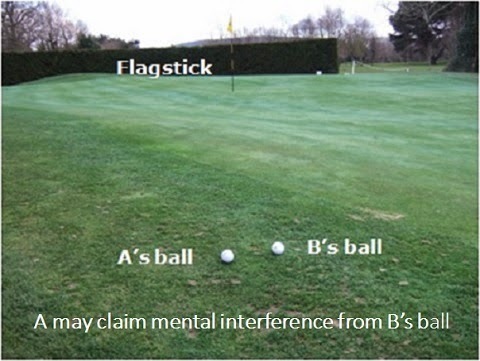 In order for A to be entitled to have B's ball lifted because of interference, does B's ball have to be on or near A's line of play and thus in a position to interfere physically with A's ball? Or may A also have B's ball lifted if it is off his line of play but catches his eye and thus constitutes mental interference? A. A player may, under Rule 22-2, have another ball lifted if the ball interferes either physically or mentally with his play. Q. As A was making his backswing, B accidentally dropped a ball, which rolled within six inches of A's ball. The appearance of the dropped ball startled A, causing him to top his shot. In equity, should A be permitted to replay his stroke? A. No. Distractions are a common occurrence which players must accept. A related point to clarify on this subject is that, in equity, a player does not have to play their ball that has come to rest in a situation that is dangerous to them, e.g. near a live rattlesnake or a bees' nest, Decision 1-4/10, but they may not take relief from a situation which they dislike; unpleasant lies are a common occurrence which players must accept, Decision 1-4/11. I have one last point, which is not backed-up by any Decision on the Rules. In my opinion, a player should not be penalised under Rule 6-8 for discontinuing play due to fog. Having played in foggy conditions on more than one occasion, there is definitely mental interference for the players, as well as the obvious possible danger for anyone on the course while play continues. Whilst Rule 6-8a states that bad weather is not of itself a good reason for discontinuing play, there is an exception which could be used when there is limited visibility due to fog; “the player must not discontinue play unless: … there is some other good reason such as sudden illness”, which I think any Committee would be wise to apply. Why not send a Rhodes Rules School eDocument for a Christmas present? All my eDocuments on the Rules can be found under the different tabs at this link. If you are purchasing for someone else, I will waive my copyright and give you permission to forward the files to those that you have purchased for. Okay Barry, you have convinced me as the senior rules official on site to put into effect a local rule about the player discontinuing play due to fog. How foggy does it have to get? What are acceptable visibility levels? If my visibility drops to 250 yards, can I halt play? Or is it 100 yards or less? What if it's foggy on one part of the golf course and not another? I need some guidelines here. There are no guidelines that I am aware of and I am not qualified to make a recommendation. In any case, I am not suggesting that Committees should introduce a Local Rule re fog, which would be difficult for the reasons that you point out. What I am saying is that if a Committee hears that a player suspended play because they thought that there was a dangerous situation due to fog, the Committee should be sensible about it and not penalise the player under Rule 6-8. Perhaps as the senior rules official you should use your judgement and authority to suspend play due to the fog? Of course, but I would guess that a very high percentage of all competitions played do not have the luxury of there being a Committee representative present to make that call. The problem comes when at some time during the competition part of the course is shrouded in fog, whilst the rest of the course may be playable. My point is that the Rules are specific in saying that players may not suspend play for bad weather, but that Committees should make allowances if a player refuses to play until fog has cleared, due to their concern about the possible danger of playing 'blind' in fog. That's exactly what we do. We tend to err on the side of caution and often hear complaints that we ought to resume play because players think they can see fine. As a rule of thumb, if visibility is less than 350 yards, we suspend play. My question concerns junior golf more than adult golf really. I have a son who is very good and plays in many tournaments. Lately, there have been 2 other kids that have begun intimidation campaigns against him. The worst is while he is putting, they will stand very close to him and swing their putters quickly back and forth. Is there a rule of golf that we can use to get them to stop these actions? Playrs can be penalised for a serious breach of etiquette, Rule 33-7. Your son should request the players in question to stand still and out of his eye line while he makes his stroke. If they refuse, or continue with this blatant gamesmanship, he should report them to the Committee, who should then interview them and take the appropriate action. This is unacceptable behaviour in any game of golf, whatever the standard.